The 3:1 is the classic mechanical advantage system used by rescuers. It requires less rope than a (non-piggybacked) 2:1 system, is reasonably easy to rig, is easy to add a progress capture device, provides an appropriate amount of mechanical advantage to raise one or two people, and with a few tweaks it can be converted into a simple 5:1 system . 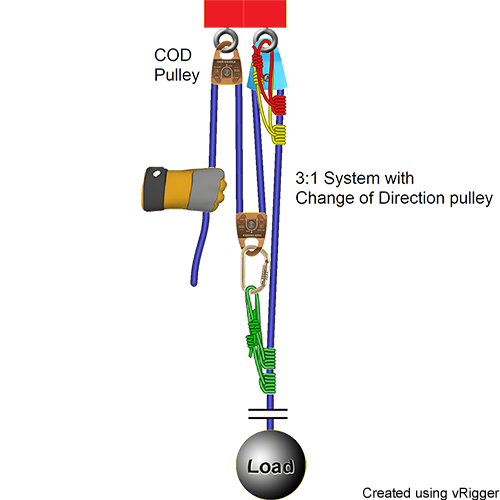 Refer to the overview on raising systems to learn more about mechanical advantage systems. Three-to-one systems are often called "z-rigs" due to their shape. Don't, however, confuse the 3:1 with the similarly-shaped 2:1 with a COD pulley or a 2:1 piggyback system. 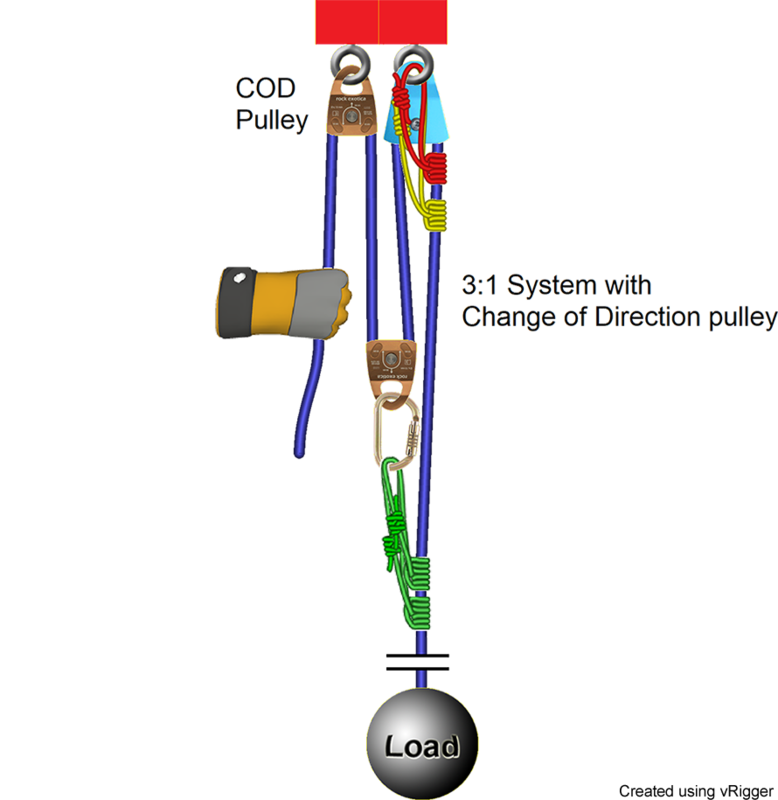 The following illustrations show 3:1 systems without and with a COD pulley. First rig a 1:1 system. The rope comes from the load and goes through one pulley. Easy enough. Now add "capture" Prusiks that will hold the load if you let go of the rope. 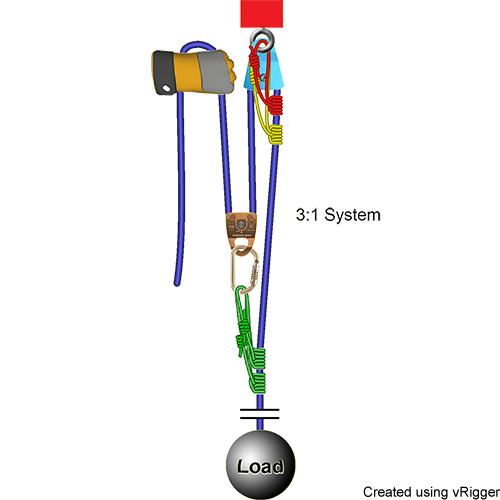 If you have enough rescuers at this point, you might try pulling on the rope to see if you can raise the load using this 1:1 system. Oftentimes this is all the rigging that is required. Pull on the rope that exits the traveling pulley. 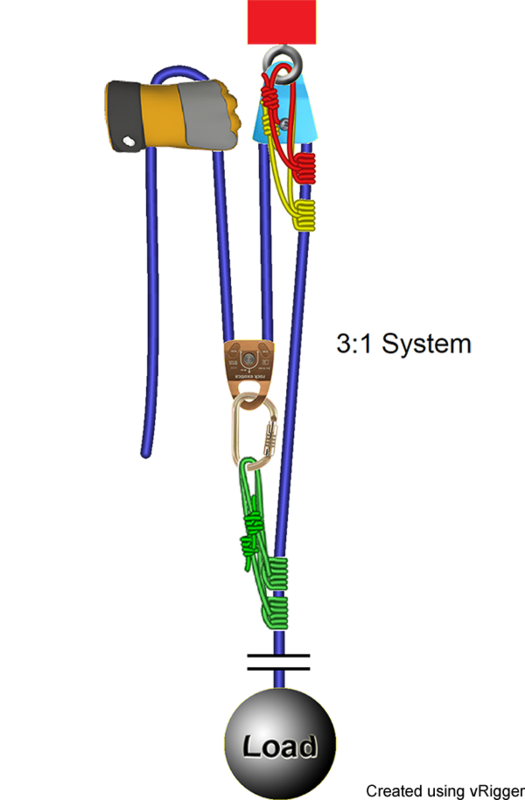 This approach of first rigging a 1:1 system and then, if required, adding a traveling Prusik and pulley simplifies the rigging of a 3:1 system. Raise the load until just before the pulleys touch. While still holding the load, set the capture Prusiks and slowly release tension to ensure that they hold. Slide the Prusik that is closest to the load down the rope as far as practical. It is obviously beneficial to have a large rigging area to reset the system. If there are only 3 meters between the pulleys in your 3:1 mechanical advantage system, you'll have to reset every time you pull 3 meters of rope and your load will have only have raised 1 meter. If you have to raise the load 30 meters, you'll need to reset the system 30 times! 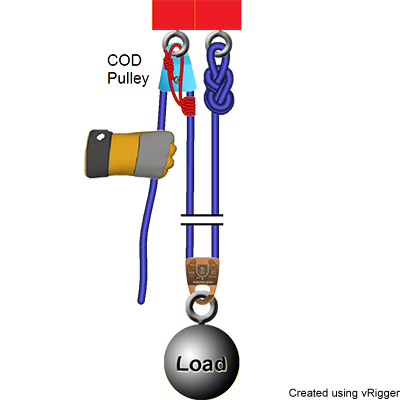 If you have a limited work area, it may be advantageous to put a COD pulley at the main anchor and build your mechanical advantage system elsewhere, as shown in this next illustration. In the above system, the capture Prusiks could be on the COD pulley (as shown) or on the rightmost pulley. 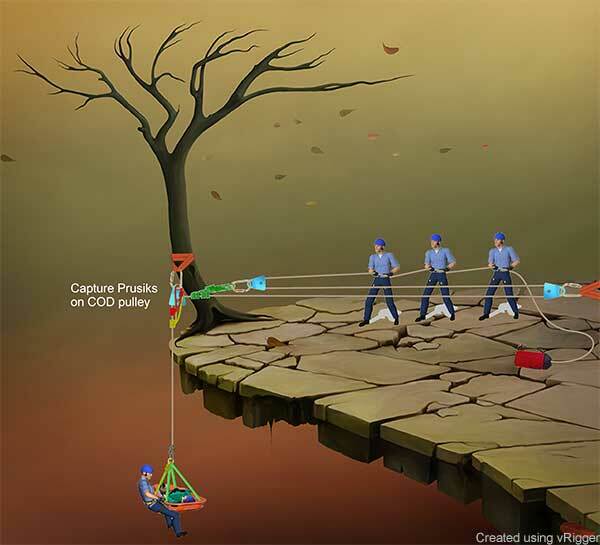 It should go without saying, but the above illustration focuses on the raising system and ignores important details, like having an independent belay to protect the litter attendant and victim, having the three rescuers secured with tethers, etc.